The EOS-1D X Mark II is Canon's flagship pro DSLR featuring a 20.2 MP full-frame CMOS sensor. 16 fps continuous shooting will enable professionals to capture precise moments when shooting action scenes on camera. Dual Pixel CMOS autofocus and a high dynamic range gives you world-class images you’d expect from Canon's top of the range camera. The EOS-1D X Mark II also allows you to record 4K movies and, crucially, to lift 8.8MP still images out of a 4K video scene. Capture the action that other cameras miss! Seize the moment in all situations with the 20MP EOS-1D X Mark II. With lightning fast and precise focusing, image quality with high latitude, incredible levels of detail and sharpness even in low light and 4K movies all from a CMOS sensor designed and made by Canon, the EOS-1D X Mark II enhances the professional photographer's creative workflow like never before. An expanded focus area with 61 individually selectable AF points, including 41 cross-type and 5 dual cross-type AF points, ensures enhanced flexibility in framing your subjects. Even at f/8, all 61 points are at your disposal including 21 cross type sensors1. Combined with the advance AI Servo AF III+ and improved EOS Intelligent Tracking and Recognition system, the EOS-1D X Mark II delivers exceptionally sharp and precise autofocus. *1The number of focusing points, cross-type focusing points, and dual cross-type AF points vary depending on the lens used. Breaking the boundaries of high-speed shooting, the EOS-1D X Mark II can shoot up to 14 fps with full AF / AE tracking or up to 16 fps in Live View, thanks to the speed of DIGIC 6+ processors and the new mirror drive system. With the CFast 2.0 media, the camera can deliver a continuous burst of up to 170 uncompressed 14-bit RAW images. The power of 4K resolution brings your stories to life. Shoot internally on CFast 2.0 (recommended) media in 4K (4096 x 2160) up to 60p or Full HD up to 120p for slow motion creativity. Focus easily and accurately with touch panel LCD and Dual Pixel CMOS AF, which provides amazing AF tracking in movies and Live View mode and works with all Canon EF lenses. Delivering outstanding performance at speeds of up to 14 fps*, and up to 16 fps*6 in Live View, the EOS-1D X Mark II camera is loaded with technologies that help facilitate speedy operation at every step of image capture. 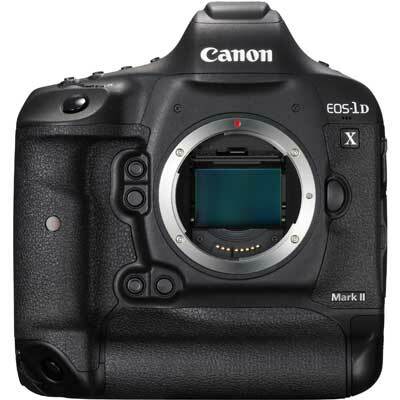 The EOS-1D X Mark II features a new mirror mechanism designed for highly precise operation with reduced vibration even at incredibly fast speeds. The shutter unit is rated for 400,000 frames and captures at up to 16 fps*6, while the CMOS sensor has high-speed signal reading that enables speedy image capture. A fast AF/AE system, Dual DIGIC 6+ Image Processors and high-speed recording with its new CFast™ card slot helps ensure that camera operations are performed quickly and precisely. Key to the performance benchmarks achieved by the EOS-1D X Mark II camera, Dual DIGIC 6+ Image Processors not only convert the light that passes through the camera's sensor into high-quality photos and movies, but also enhance the camera's overall performance. Improvements include high-speed processing, up to 16-fps*6 operation for stills and 4K/60p movies, lens distortion and diffraction correction during operation with virtually no effect on the camera's speed, plus fast write times and much more. Achieves a maximum burst rate of up to 170 RAWs in continuous shooting at up to 16 fps, and 4K movies using CFast cards in the new CFast 2.0*5 slot.